Draft: 2012, Cleveland Indians, 10th rd. Joshua Martin… Married, wife's name is Elizabeth… Graduate of Enterprise High School (AL)… 2012 graduate of Samford University (AL), where he helped lead the school to its first NCAA tournament appearance as a senior and set the all-time Samford record with 24 wins… Signed by: Chuck Bartlett. Began the season on the DL with a left oblique muscle strain; was activated and assigned to Columbus (AAA) on 7/7 after a rehab assignment with the Arizona League Indians (R) l Posted a 0.92 ERA (2 ER, 19.2 IP) over his first 17 appearances of the season l Held RHH to a .217 AVG (10-46) l Recorded at least one strikeout in 18 of his 19 appearances with Columbus. Spent season at AAA Columbus and missed two months (June 12-Aug. 12) with right elbow soreness, which required offseason surgery to clean up loose bodies (Sept. 11)...Left-handed batters hit .238 (15/63) off him, batters hit .167 (10/60) with runners on base and .129 (4/31) with runners on base. Spent the entire season in AAA Columbus after spending spring in San Diego Major League camp, posting a 10.64 ERA in 12 exhibition outings (11.0IP, 16H, 13ER, 12SO) ...Designated for assignment on April 3 and assigned back to the Indians organization on April 12 (accrued 10 days of MLB service)...7 of his 25 earned runs allowed at Columbus came in consecutive outings, June 7-10, where he recorded only 4 outs...Also allowed 4 ER on Aug. 31 at Durham in 0.1IP... Around those outings posted 1.65 ERA in 10 July outings (16.1IP, 15H, 3ER)...From June 11, end of season he posted an ERA of 1.73 to end the season (41.2IP, 8ER, 29 games)...Enjoyed a 16-game, 22.2 inning consecutive scoreless streak from June 10-July 21...Right-handed batters hit .219 (30-137, 2HR) off him and runners batted .237 (28-118) off him with runners on base...Posted a 3.38 ERA in 2 IL Postseason games (2.2IP, 3H, 1ER). Spent the entire season with Double-A Akron, going 8-1 with a 2.27 ERA (17 ER, 67.1 IP), 80 strikeouts against 19 walks and a .192 opponents average in 44 relief appearances…Named an Eastern League Mid-Season All-Star for Akron…Over his first 27 relief appearances in the first half, went 6-0 with a 1.36 ERA (7 ER, 46.1 IP), 49 strikeouts against 14 walks and a .167 opponents average before going 2-1 with a 4.29 ERA (10 ER, 21.0 IP) over his final 17 outings…Selected by the Padres in the first round (seventh overall) of the Major League phase in the Rule 5 draft after the season…Following the year, pitched in 17 games for Leones del Caracas in the Venezuelan Winter League, going 1-1 with a 5.68 ERA (8 ER, 12.2 IP) and 11 strikeouts against four walks over 17 relief appearances. 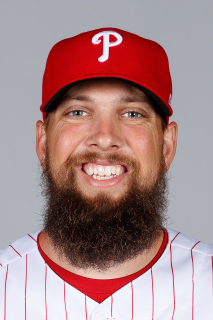 21 de diciembre de 2018 Philadelphia Phillies agente libre firmado RHP Josh Martin con un contrato de la ligas menores y invitado a spring training. 21 de diciembre de 2018 RHP Josh Martin asignado a Lehigh Valley IronPigs. 2 de noviembre de 2018 RHP Josh Martin eligio agente libre. 13 de octubre de 2018 RHP Josh Martin asignado a Leones del Escogido. 13 de octubre de 2018 Leones del Escogido ponen a RHP Josh Martin en la lista de reserva. 13 de octubre de 2018 Leones del Escogido reasignado RHP Josh Martin a las ligas menores. 7 de julio de 2018 Columbus Clippers activan a RHP Josh Martin de la 7-d&iacute;a lista de deshabilitado. 30 de junio de 2018 Columbus Clippers envian a RHP Josh Martin una asignaci&oacute;n de rehabilitaci&oacute;n a AZL Indians 1. 26 de junio de 2018 Columbus Clippers envian a RHP Josh Martin una asignaci&oacute;n de rehabilitaci&oacute;n a AZL Indians 2. 22 de junio de 2018 Columbus Clippers envian a RHP Josh Martin una asignaci&oacute;n de rehabilitaci&oacute;n a AZL Indians 1. 6 de abril de 2018 Columbus Clippers ponen a RHP Josh Martin on the 7-d&iacute;a lista de deshabilitado. 4 de enero de 2018 Cleveland Indians invitado fuera del roster RHP Josh Martin para spring training. 13 de agosto de 2017 Columbus Clippers activan a RHP Josh Martin de la 7-d&iacute;a lista de deshabilitado. 13 de junio de 2017 Columbus Clippers ponen a RHP Josh Martin on the 7-d&iacute;a lista de deshabilitado. Right elbow inflammation. 20 de enero de 2017 Cleveland Indians invitado fuera del roster RHP Josh Martin para spring training. 25 de agosto de 2016 Columbus Clippers activan a RHP Josh Martin de la lista temporalmente inactiva. 20 de agosto de 2016 Columbus Clippers ponen a RHP Josh Martin en la lista de inactivos temporalmente. 13 de abril de 2016 RHP Josh Martin asignado a Columbus Clippers. 12 de abril de 2016 RHP Josh Martin devuelto a Cleveland Indians de San Diego Padres. 3 de abril de 2016 San Diego Padres designado Josh Martin para la asignaci&oacute;n.
10 de diciembre de 2015 San Diego Padres reclamado RHP Josh Martin fuera de waivers de Cleveland Indians. 30 de septiembre de 2015 RHP Josh Martin asignado a Leones del Caracas. 13 de marzo de 2015 RHP Josh Martin asignado a Cleveland Indians. 31 de agosto de 2014 RHP Josh Martin asignado a Akron RubberDucks de Carolina Mudcats. 6 de julio de 2013 RHP Josh Martin asignado a Carolina Mudcats de Lake County Captains. 31 de marzo de 2013 Josh Martin asignado a Lake County Captains de Carolina Mudcats. 28 de agosto de 2012 Josh Martin asignado a Carolina Mudcats de Mahoning Valley Scrappers. 16 de junio de 2012 Josh Martin asignado a Mahoning Valley Scrappers de Cleveland Indians. 6 de junio de 2012 Cleveland Indians firmado RHP Josh Martin.